The Ebricks.com Slate Roofing guide offers information about companies such as CertainTeed and Sheldon Slate Products Co., Inc..
Made from recycled polymers, Authentic Roof is the original synthetic slate. This third-generation family-owned business quarries Vermont Grade S-1 architectural roofing slate from mines in production for more than a century. Evergreen Slate is the largest producer and supplier of roofing slate in the United States. In business since 1916, the company suppliers Vermont for roofing, flooring, flagstone, landscape stone and structural applications. 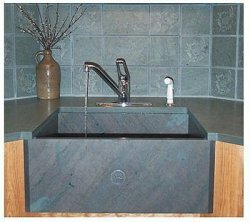 Durable slate makes a beautiful, distinctive countertop. A lightweight alternative to slate.